Growing up on the farm, a pack of dogs was always a part of life. At night, they’d patrol the property chasing off predators which threaten our chickens or sheep. After many years, the dogs bore several scars on their muzzles from these nightly encounters. Some of our dogs even had an instinct for herding, a trait that was quite helpful when moving sheep. But more than their pragmatic uses as tools, our dogs were appreciated for the companionship they provide. They accompanied walks through the woods, treks around the farm for chores, and other expeditions conducted by boys on the farm. I recall one day searching for my little brother Evan, finding him under my grandparents porch happily digging a hole with our dog Maximus. They were both very excited to have each others help digging the hole, though I don’t know who’s idea the hole was. On the Barnard Family Farm, just a few miles away from our own farm outside Darlington, IN, there is a new litter of puppies looking for a home! 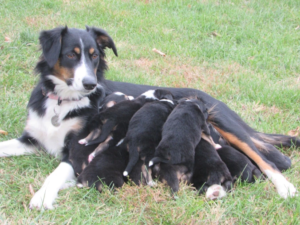 The Barnard’s with their Town and Country English Shepherd program breed, train and sell English Shepherds. These dogs can be great for farm tasks such as herding, as well as loved members of the family. They can protect the family and livestock, or help little boys dig holes. The Barnard family’s most recent litter. For more information on these puppies, check out Town and Country ES. ← Thanksgiving Turkeys are Selling Fast! Our news, your inbox. Subscribe for specials, sales, and more!